The ability to infer cause and effect, based on the frequency with which one event co-occurs with some other event, is called “adaptive” or “Bayesian” learning. Humans, pigeons, and many animals have this ability to learn relationships in their world. Still, one thing that separates humans from animals is the ability to evaluate whether there is really any actual mechanistic link between cause and effect. When we stop looking for those links, and believe that one thing causes another because “it just does” – we give up the benefits of human intelligence and exchange them for the reflexive impulses of lemmings, sheep, and pigeons. The occurrence of superstitious beliefs is an inevitable consequence of an organism’s ability to learn from observation of coincidence. Comparison with previous experiences improves the chances of making the right decision. While this approach is found in most learning organisms, humans have evolved a unique ability to judge from experiences whether a cause has the power to mechanistically produce the observed effect. Such strong causal thinking evolved because it allowed humans to understand and manipulate their environment. Strong causal thinking, however, involves the generation of hypotheses about underlying mechanisms. When we fail to think about the mechanisms that link cause and effect, we lose much of the benefit of having a human intelligence. In general, the larger the events, the more important the events are to survival, and the closer in proximity those events occur, the more likely an organism is to believe those events are tied together by cause and effect. This makes the 2008-2009 credit crisis an ideal playground for superstition. When we examine the 2008-2009 credit crisis in retrospect, there’s no question that the central concern at that time was that massive bank failures would trigger a “global financial meltdown.” The risk of widespread failures was driven by losses in mortgage-backed securities and related assets held by major banks, and by highly leveraged financial institutions like Bear Stearns and Lehman, representing the “shadow” banking system. The balance sheet of a major bank looks like this: for every $100 of assets, the bank typically owes about $60 to depositors and $30 to bondholders, with the other $10 representing retained earnings and “equity” capital obtained by issuing stock. With $100 in assets against $10 in capital, a bank like this would be “leveraged 10-to-1” against its equity capital. At non-banks like Bear Stearns and Lehman, the leverage ratios were 30-to-1 or higher. Given 30 times leverage, it only takes a decline of just over 3% in the value of the assets to completely wipe out the capital and leave the company insolvent (as the remaining value of assets would be unable to pay off the existing obligations to customers and bondholders). In such an environment, a “run” on the institution can force asset sales, which accelerate capital losses and increase the likelihood of insolvency. Under existing accounting rules, banks and other financial institutions were required to report the value of the securities they held, using prevailing market prices, a requirement known as “mark-to-market.” As asset values collapsed in 2008 and early-2009 because of mortgage losses, financial institutions across the globe found themselves rapidly approaching insolvency. As the willingness of investors to buy mortgage securities seized up, and economic activity plunged, the Federal Reserve stepped into the financial markets and became the major purchaser of existing and new mortgage securities issued by Fannie Mae and Freddie Mac. This arguably helped to support continuing activity in the housing market, but it is not what ended the crisis. Rather, the crisis ended – and in hindsight, ended precisely – on March 16, 2009, when the Financial Accounting Standards Board abandoned mark-to-market rules, in response to Congressional pressure by the House Committee on Financial Services on March 12, 2009. The decision by the FASB gave banks “significant judgment” in the values that they assigned to assets. With that discretion, banks could use cash-flow models (“mark-to-model”) or other methods (“mark-to-unicorn”). The problem for investors is that this was quite a subtle event – hardly memorable, and certainly not grand and obvious like the Federal Reserve’s intervention was. But we are wired for survival, and the larger the events, and the closer they are in proximity, the more likely we are to draw cause and effect connections between them. That’s particularly true if there is at least a weakly logical way that they might be related (as was true the Fed’s mortgage support). Importantly, the impact of the FAS 157 change is easier to appreciate in hindsight than it was in the fog of war. Its success relied on regulators to go along with the new numbers, and bank depositors and customers to believe them. I've frequently discussed our own response to the crisis, which was to insist that our methods to estimate market return/and risk were robust to Depression-era outcomes (even though our existing methods had anticipated the crisis and performed admirably during the market collapse). It's no secret that we missed returns in the interim as a result. We are evidence-driven investors, and similar economic and financial disruptions were simply out of context from the standpoint of post-war evidence. Nevertheless, it's critical to go back and understand the actual mechanism that ended the crisis, so that we as investors don't allow ourselves to be misled into an increasingly false sense of security about Federal Reserve actions. It's probably also worth observing how heavilly banks have relied on the release of "loan loss reserves" in order to beat earnings estimates in recent periods. The misattribution of cause and effect in 2009 created the Grand Superstition of our time – the belief that Federal Reserve policy was responsible for ending the financial crisis and sending the stock market higher. By 2010, this narrative was so fully accepted that the Fed’s announcement of further “quantitative easing” was met by equally great enthusiasm by investors. Complicating matters, the European Central Bank forestalled a currency crisis in Europe through massive purchases of debt from credit-strained member countries. While this action was interpreted as quantitative easing, it actually functioned as a funding operation to weaker countries that was much more akin to a fiscal subsidy from stronger countries like Germany. Still, the fact that it was executed by the central bank and eased the Euro crisis helped to contribute to a perception that central bank purchases of government securities – in and of themselves – are sufficient to support the stock markets indefinitely. Worse, perception creates its own reality in the financial markets, so provided enough investors believe something to be true, the outcome is the same as if it really were, but only for a while. Don’t misunderstand. Quantitative easing has undoubtedly been the primary driver of stock prices since 2010. But the benefit of having a human intelligence is the ability to evaluate the extent to which there is any mechanistic link between the cause and the effect. If there is not, investors may be resting their confidence on little more than perception and superstition. This is exactly what historical data indicates. In the case of quantitative easing, there is one variable that is tightly, logically, and consistently linked to Fed actions. We have nearly a century of evidence that the amount of base money created by the Fed (per dollar of GDP) is strikingly related to the level of short-term interest rates. The chart below illustrates this relationship in data since 1929. Yet the same effect is not observed with anything close to the same strength for long-term bond yields. 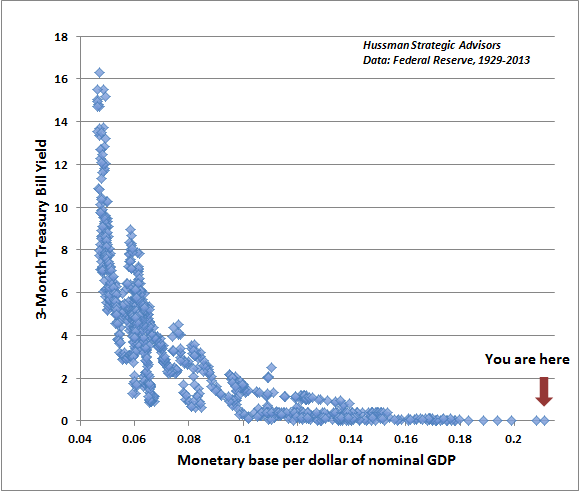 Worse, looking over the full course of history, there is virtually no relationship between the monetary base (level, change, ratio to GDP) and stock returns (regardless of whether one examines concurrent returns, subsequent returns, yields, or estimated prospective market returns). The reason for the weak relationship between the monetary base and stock prices is simple. Though the monetary base is strongly related to Treasury bill yields, it turns out that Treasury bill yields themselves are only weakly related across history to stock yields. The belief in a close relationship between interest rates and stock yields is actually driven by the strong inflation-deflation cycle from 1970 to about 1998. Outside of this period, stock yields and interest rates have generally been negatively correlated. There’s no denying that since 2008, there has been a correlation of more than 90% between the level monetary base and the level of the S&P 500. But this is an artifact of how correlation is calculated. The correlation between any two diagonal lines is nearly always greater than 90%. Unfortunately, the moment we examine data that doesn’t resemble a diagonal line (for example, year-over-year changes in the monetary base versus stock prices prior to 2009), the correlation doesn’t hold up at all, and variations in the monetary base explain only about 1-3% of variations in stock prices. Still, the rate of monetary growth has been breathtaking in recent years, relative to history, so it’s important to understand the mechanism by which QE has exerted its effects more recently. Simply put, quantitative easing impacts stock prices by creating a mountain of zero-interest cash that must be held by someone at each point in time. The hope and mechanism behind QE is to force those cash holders to feel so distressed that they reach for yield in speculative assets they would otherwise choose not to hold. The process ends at the point where investors are indifferent between holding zero-interest cash and more speculative securities such as long-term bonds or stocks. At this point, every speculative security is priced to achieve the lowest possible risk premium that investors are willing to accept. And here we are. What’s important here is that in any environment where savers and investors actually desire relatively safe assets as part of their portfolios, quantitative easing is likely to be wholly ineffective in supporting stock prices. 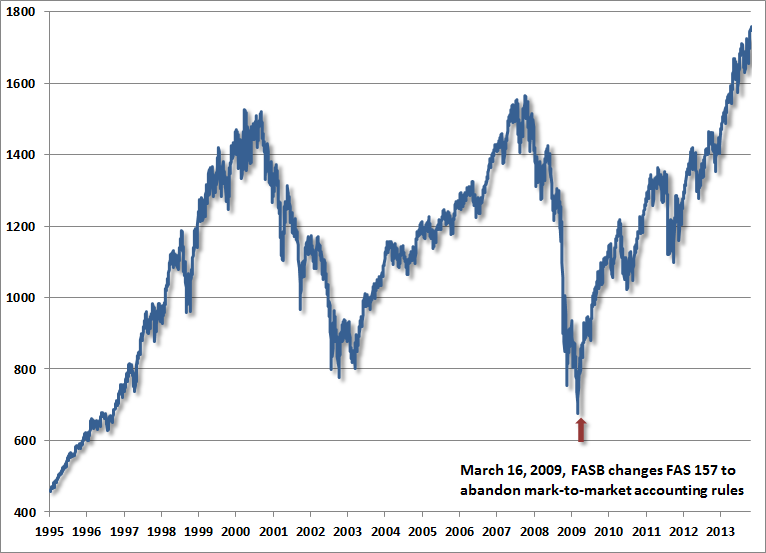 Recall that stock prices collapsed by half in 2000-2002 and again in 2007-2009 despite aggressive monetary easing. A friendly Fed doesn’t help stocks to advance except in environments where investors are already inclined to accept risk. To believe that QE makes stocks go up because “it just does” is superstition. As for employment, it’s quite straightforward to demonstrate that there is virtually zero relationship between changes in the monetary base and subsequent job growth, nor is there any inverse relationship between inflation and unemployment (the actual relationship is weakly positive and slopes up), nor between inflation and subsequent unemployment, nor in countless other variants of monetary “transmission” that Fed members and Wall Street economists constantly assert as if the evidence actually supports their statements. That said, there are certainly some relationships that can be demonstrated in the data. For example, if we look at stock market changes and real GDP, it turns out that every 10% change in the stock market is associated with a temporary increase in real GDP over the following year or two in the range of 0.3% and 0.5%. So a 40% increase in the market is correlated with an increase of about 1.2% to 2% in real GDP. It’s not clear that this is actually a correlation that can be manipulated to encourage higher GDP – which is what the Fed is trying to achieve – but it’s at least a relationship that can be estimated. Likewise, if we look at stock market changes and employment, it turns out that every 10% change in the stock market is associated with a temporary decrease in the unemployment rate of about 0.2%. So a 40% increase in the stock market is correlated with a decline of about 0.8% in the unemployment rate. Again, it’s not clear that this is actually a correlation that can be manipulated, but that’s the order of magnitude that can be expected even if the Fed’s efforts are successful. As for the Phillips Curve, it’s important to recognize that the actual Phillips curve is a statement about wages, not general prices. There is, in fact, a strong inverse relationship between unemployment and real wage inflation. Low unemployment is associated with faster growth in real wages. High unemployment is associated with slower growth in real wages. This can be demonstrated clearly, and in data from many countries. This is the phenomenon that A.W. Phillips described in his 1958 paper on the subject. Though he stated the relationship between unemployment and wage inflation in nominal (“money”) terms, Phillips based his conclusions on a century of data where Britain was on the gold standard and general prices were very stable, so in effect, the “money” wage fluctuations observed by Phillips were actually real wage fluctuations. In sum, the financial markets presently rest on a spectacular and exaggerated superstition about the power of Fed policy to impact the financial markets and the real economy. This superstition was born of crisis, and is likely to end in crisis, as investors re-learn what they should have learned about Fed policy in the 2000-2002 and 2007-2009 plunges. The vast majority of the benefit from “don’t fight the Fed, don’t fight the tape” comes from the “tape” part of that aphorism. That combination is powerfully outperformed by the combination of embracing favorable market action, amplifying or muting that response based on valuation, and entirely avoiding overvalued, overbought, overbullish conditions (see Aligning Market Exposure with the Expected Return/Risk Profile for a simple illustration, and Following the Fed to 50% Flops for a reminder of the danger of following the Fed in situations when these other conditions have been unfavorable). From a full-cycle perspective, I continue to believe that the stock market is vulnerable to potential losses in the 40-55% range, much like we observed and anticipated in 2000-2002 and 2007-2009. I wish this were different, and that we were instead observing a landscape of investment opportunities, with reasonable prices, high prospective returns, and supporting the economy by channeling savings to productive investment. As conditions stand, we observe a speculative carnival. We presently estimate 10-year expected nominal total returns for the S&P 500 of just 2.5% annually. From the standpoint of evidence, which is how we set our investment positions, we continue to observe uneven, speculative, and overbought market action, with spike in the difference between advisory bullishness and bearishness according to Investors Intelligence. In addition, the S&P 500 has moved through its upper Bollinger bands at daily, weekly and monthly resolutions (two standard deviations above the respective 20-period moving averages). We also observe rich valuations on a wide variety of measures that are tightly correlated with subsequent market returns. These valuations are exemplified by a Shiller P/E (S&P 500 divided by the 10-year average of inflation adjusted earnings) that has now reached 25. Among other factors, this full syndrome of severely overvalued, overbought, and overbullish conditions removes the basis for “contingent” positions – specifically index call options – and significantly raises our immediate concern about market risk. Particularly since late-2011, overvalued, overbought, overbullish syndromes that have historically resulted in striking market losses have instead been followed by further speculation. Still, a further speculative blowoff would only raise the cliff that we believe the market already faces over the completion of this cycle. Consider us defensive – possibly to varying degrees depending on near-term evidence – but generally defensive in any event. Strategic Growth remains fully hedged, with a “staggered strike” position that raises the strike prices of its index put options modestly below present market levels. Strategic International is fully hedged. Strategic Dividend Value is hedged at about 50% of the value of its stock. Strategic Total Return continues to carry a duration of just over 6 years (meaning that a 100 basis point move in interest rates would be expected to impact Fund value by about 6% on the basis of bond price fluctuations, just over 8% of assets in precious metals shares, and a few percent of assets in utility shares.